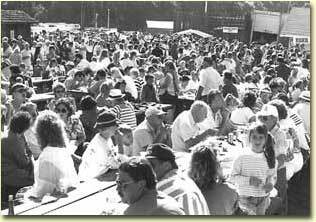 Since the early 1970’s “The Worlds Largest Salmon Barbeque” has delighted salmon lovers young and old. 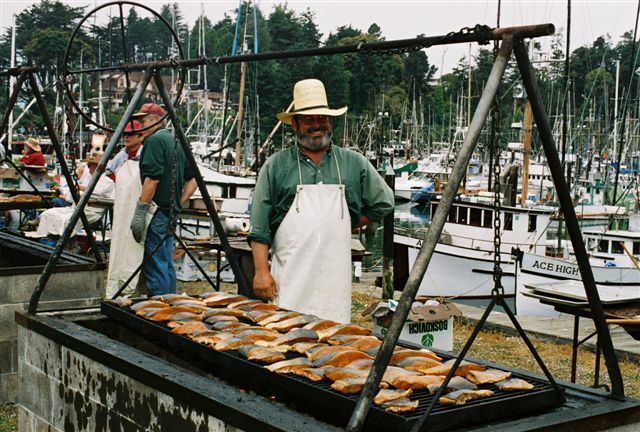 Every year in conjuction with the Independance Day festivities in Fort Bragg, California, the barbeque is one of the primary sources of funding for the year for the Salmon Restoration Association. This year, the 2015 Salmon Barbeque is scheduled for Saturday, July 4th, from 11 am to 6 pm. BBQ Tickets are $30 at the door or $23 at Harvest Market before 5:oo pm Friday. Admission is free. 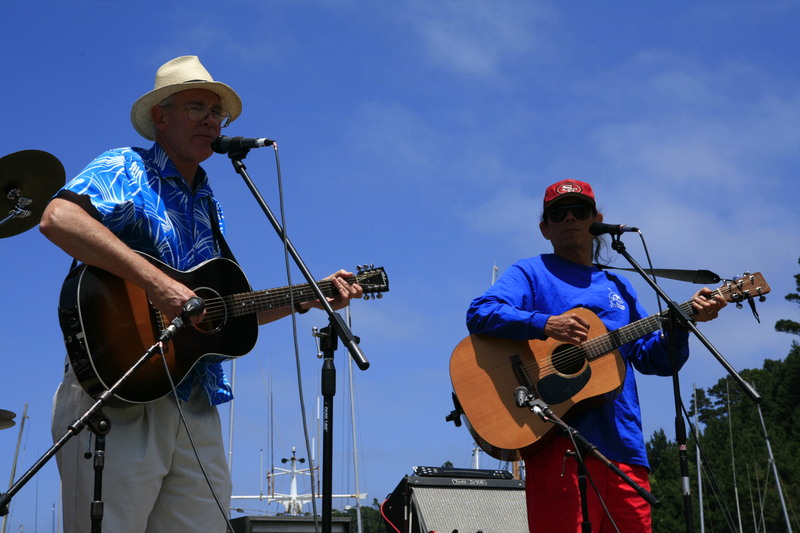 Come and listen to the music and enjoy the afternoon in Noyo Harbor at South Harbor Drive. The Salmon Restoration Association (SRA) provides shuttle service from College of the Redwoods parking lot to South Noyo Harbor from 11:00 am to 6:00 pm. In the past the salmon barbeque has fed and entertained more than 4,000 people at this huge community event. There will be live music, the aroma of grilled salmon, family and friends and meet new friends. Great food and a love of the outdoors are all part of the atmosphere at the barbeque. Trade fish stories with and “old salt”, or join one of our younger attendees in learning about the efforts of the Salmon Restoration Association. Come for a good old fashioned barbeque. There will be grilled salmon with all the fixins, so bring your appetite. And remember, you aren’t just having a great time eating great food, you’re supporting the restoration and preservation of our wild pacific salmon resources. About the Associaton: The Salmon Restoration Association exists for one reason: To take positive, measurable action to restore the natural wild salmon runs to rivers of Northern California. The association is a non-profit organization, and our primary funding come from two sources: The California Department of Fish and Game reserves a portion of the sales of commercial salmon tags for restoration work, and our annual event; The Worlds Largest Salmon Barbeque. Now a part of California’s history. Representative Mike Thompson of the 3rd district, has filed The Salmon Restoration Association’s “Worlds Largest Salmon Barbeque” as a Local Legacy project with the Library of Congress. This entry was posted in Mendocino Interest and tagged california department of fish and game, forth of July, library of congress, noyo harbor, salmon, salmon restoration association, wild pacific salmon, worlds largest salmon barbeque.